Some people are Cubs fans, others find it more interesting to watch the Assessor. 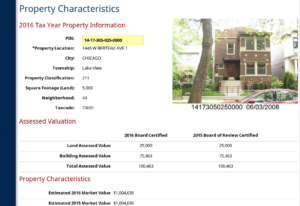 Now, under Cook County’s current rules, the tax bill is based on the assessment of the total parcel and it makes no difference which part is land and which part is building. But with the building gone, it’s important for the assessed value to represent what the land is really worth. Otherwise the rest of us taxpayers have to cover part of Mr. Lester’s share.